I was recently working with an outsourcing project team that consisted of people from two different organizations and a multitude of different countries. There was already a certain amount of angst in the group due to some recent timelines not being met and hence displeasure from the sponsoring managers. One of the first things that I did was to invite the project team members to raise some of the frustrations that they were experiencing. There was a commonality across all of the teams irrespective of where they were located - poor communication, lack of alignment on timelines, difficulties understanding accents and different work styles, anxiety around meeting expectations and a lack of trust and personal relationships where highlighted. It was a rather candid conversation that enabled the invisible to become visible. Once the air was cleared, the project team was then able to appreciate some of the reasons for the complications and miscommunications that they had been experiencing, agree on some common guidelines and actually allocate some time to engage in getting to know each other on a more personal level. The sense of relief and camaraderie was evident at the end of the day and it continued once they returned to their project locations. Critical to virtual cross-cultural team success is adaptation to different styles of communication, methods for sharing information, giving and seeking feedback, decision-making, working across time zones and maintaining staff engagement. These all require adaptable, versatile skillsets. What are the expectations when it comes to responsiveness to emails, phone calls etc? How will constructive feedback be delivered during the project? How will information be shared and integrated during the project? How will individuals and teams be rewarded for project results and collaboration during the project? How will team alignment and engagement be encouraged and monitored throughout the life of the project? How will you know that the team is engaged? Watch the interview with Tom and the Australian Institute of Human Resources speak about how HR professionals and leaders can bridge the cultural gaps. 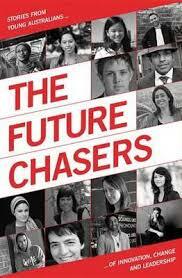 Future Chasers is a collection of stories from 15 young people who are making significant contributions to Australian society. Dr Jan Owen CEO of Foundation for Young Australians (FYA) captures the individual stories of her interviewees and was particularly curious about whether there were any common links ­behind their success. They are inspiring, talented, courageous young people who have had some incredible achievements in a range of areas from politics, to the arts and technology. Collectively, the stories provide a suite of insights into our current generation of leaders. Together, they articulate a bold vision for where they believe the future should lie in Australia and what needs to be done to get there. I was fascinated to learn about some of the commonalities that the interviewees all had and particularly enjoyed the diverse variety of backgrounds and achievements of the interviewees. This is an inspiring book that showcases some amazing future leaders and serves as a great reminder that acting to create change can and does work. 'CQ For Global Leaders' podcast features this month Tom speaking about the five attributes required to be a culturally intelligent leader.